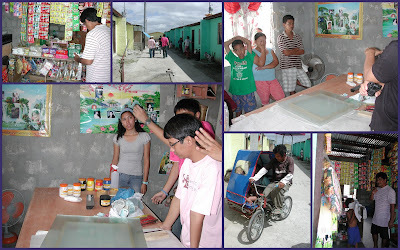 The success of the Rafe Shoe/Bag Sale and photo exhibit held last two months of 2009 was able to help Ondoy families start a new life. The Tapulanga Foundation asked the assistance of Operation Compassion (OC) who assists 732 displaced families of Typhoon Ondoy by providing counseling, housing and livelihood programs to the families from Marikina now relocated in Binan, Laguna. The foundation donated to seven livelihood projects. Manong Renato Flores was the beneficiary of a sari-sari store in his new house. I met with 3 of the four beneficiaries of a t-shirt printing business. Jeffrey, Melody and Byron are out-of-school youths who will be helping provide for their families already with this business. OC will be providing training for them and clients for the business especially as elections is approaching so campaign shirts and banners will be very much in demand. Then, two fathers came with their new tricycabs! I also visited Marikina and met up with the families the foundation already helped last year. The Corbito families have started rebuilding a new life and more help will be extended to them by the foundation. Amon and his brother who are carpenters need more tools for their work. Lisa, Amon's wife, who is a skilled dressmaker, would like to have her own sewing machine so that she can have a dressmaking business at home. Mimi, Amon's sister-in-law, would like more capital for the small sari-sari store she set up just at her house as she had to resign from her work when Typhoon Ondoy hit them and now has to stay home and take care of her parents who live with them as well. I visited Amon's house which was built again using used materials (his entire house was destroyed by the typhoon). He and his wife grew vegetables at the back of their house for their food consumption.